That is why I am not a fan of collections. "You can't take it with you," I say. So what is the point of materialism and hoarding items? Collections often are manifestations of obsessive-compulsive stars, and they scare me. But my Chewbacca collection is different. Over the past two weeks, my Chewbacca collection has had a Renaissance because I have discovered a little-known website titled eBay.com. My Chewbacca collection has ballooned from nine figures to 15 and a Chewy Frisbee. My Chewy collection is the only collection I have, and I like to think it is not a collection, but a commentary about other collections. Some collectors make common, grave errors with their collections, and I will not make those mistakes. For example, I do not believe action figures, or any toys, have greater value if they are not opened or played with. Chewies must be used! 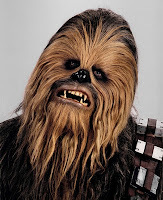 I also refuse to pay significant cash for Wookiees (correct spelling). Friends tell me there must be numerous "greater" Chewy collections, but by my criteria, I like mine just fine because I am not a Star Wars geek and consider it "the greatest." Why Chewbacca? The Wookiee speaks to me. Quirky and hairy, he is an elegant gentleman.